A team of University of Alabama students is preparing to present a Chevrolet Camaro they transformed into an electric hybrid vehicle, which will be the culmination of a grueling four-year program. 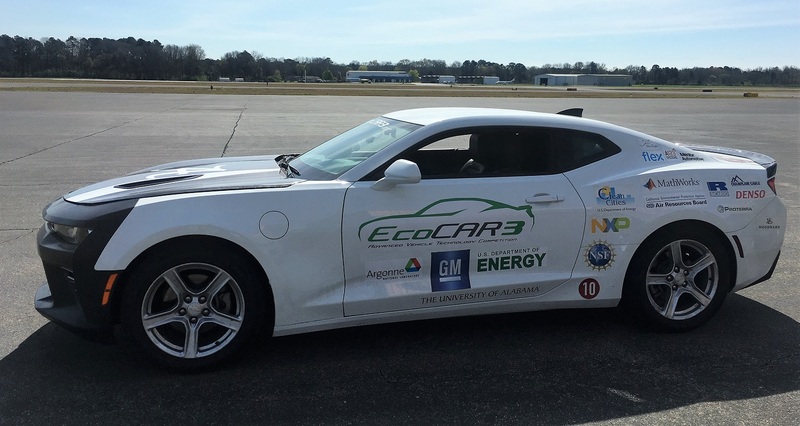 The UA team in the EcoCAR 3 program, a competition among North American universities to design and construct an advanced, energy-efficient vehicle, showed off the redesigned Camaro to the media in March. They will fine tune the car before heading to the program’s finale in June. “I think we’re in a really good place as we move toward competition,” said Haley Loftis, project manager of UA’s team and a STEM MBA student from Kansas City. “I would say we have met the objectives as a proof of concept for a more green sports car. 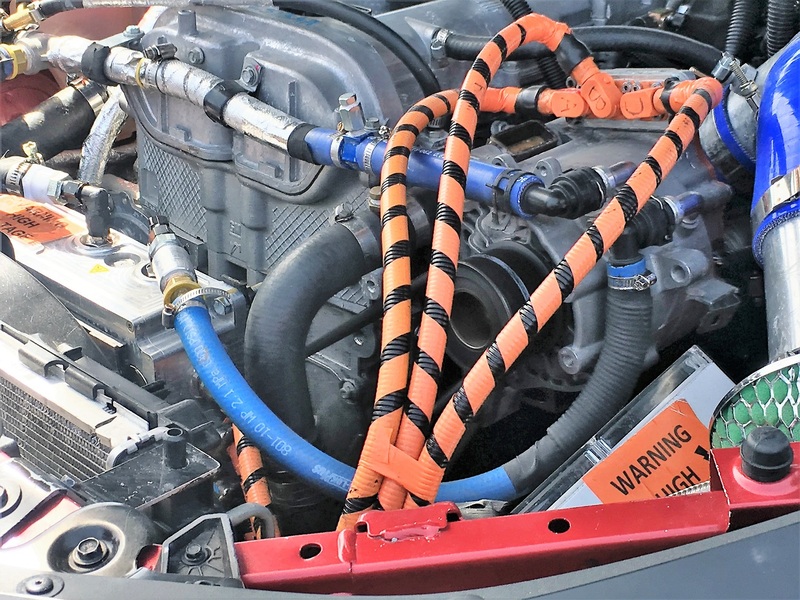 “We still have a lot of work to do in terms of benchmarking our car’s performance, but it operates as a functional plug-in hybrid electrical vehicle and cuts emissions from those of a regular engine-powered vehicle,” she said. Loftis leads a team of about 62 students from across campus who work on the engineering, marketing, publicizing and commercial development of the remade Camaro. 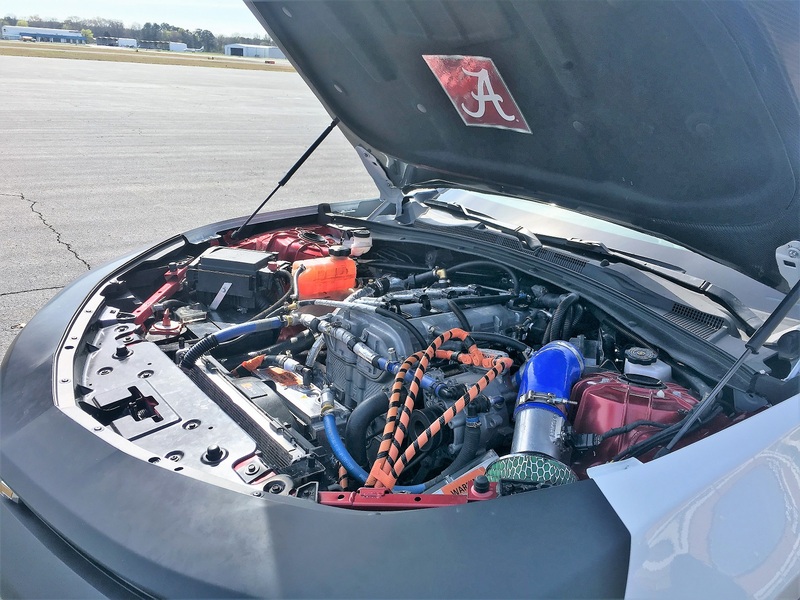 University of Alabama’s EcoCAR 3 speeds toward finish line after four years in the shop from Alabama NewsCenter on Vimeo. Perhaps more important than the project’s outcome is the experience of applying classroom knowledge in a realistic setting, said Dr. Paul Puzinauskas, UA associate professor of mechanical engineering and team adviser. In 2014, UA was selected as one of 16 institutions to participate in EcoCAR 3, an engineering competition sponsored by General Motors Co. and the U.S. Department of Energy. The competition challenges students to create a car that uses less energy and emits less pollution without sacrificing performance, safety or consumer appeal. This is the first team from UA in more than 20 years to participate in the Advanced Vehicle Technology Competition Series, established by the federal energy department and managed by Argonne National Laboratory. The four-year competition engages the next generation of automotive professionals in engineering, business and communications, allowing students to experience the vehicle development and launch process from design to marketing. More than 200 students from eight disciplines have been part of UA’s team over the four years. The team also works with the Capstone Agency, a student-run public relations firm, to help with marketing and media relations. During the competition, students conceive, design and integrate an innovative, state-of-the-art powertrain into the newly redesigned Chevrolet Camaro, donated by GM. The objectives are to maximize vehicle fuel efficiency, maintain federal emissions and safety standards and improve vehicle performance, while satisfying consumer demands for flawless drivability and affordable cost. The students’ success in meeting these objectives is evaluated yearly before the final evaluation at the end of the competition. The UA team turned the gasoline-powered Camaro into a blended plug-in hybrid with a smaller internal combustion engine supplemented by two electric motors. The team aims to have the Camaro travel 48 miles on the equivalent of one gallon of gasoline compared with the 28 mpg it is rated to achieve. “There are cars out there that are plug-in hybrids, but, in terms of vehicle architecture, no car on the market is going to be like this,” said Josh Stoddard, engineering manager for the team and a graduate student in mechanical engineering. and leaving the team has been one of the challenges, but also part of the learning experience, Loftis said. In fact, about 15 students from the team are already working for GM or have accepted positions after graduation, Puzinauskas said. That does not account for the many who took or will take jobs with other program sponsors, including communication and business students, he said. The program’s finals are held in Arizona and California starting May 10.